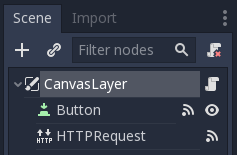 The HTTPRequest node is the easiest way to make HTTP requests in Godot. It is backed by the more low-level HTTPClient, for which a tutorial is available here. For the sake of this example, we will create a simple UI with a button, that when pressed will start the HTTP request to the specified URL. Button.pressed: When the button is pressed, we will start the request. HTTPRequest.request_completed: When the request is completed, we will get the requested data as an argument. Below is all the code we need to make it work. The URL points to an online API mocker; it returns a pre-defined JSON string, which we will then parse to get access to the data. With this, you should see (hello:world) printed on the console; hello being a key, and world being a value, both of them strings. For more information on parsing JSON, see the class references for JSON and JSONParseResult. Note that you may want to check whether the result equals RESULT_SUCCESS and whether a JSON parsing error occurred, see the JSON class reference and HTTPRequest for more. Please note that, for SSL/TLS encryption and thus HTTPS URLs to work, you may need to take some steps as described here. Also, when calling APIs using authorization, be aware that someone might analyse and decompile your released application and thus may gain access to any embedded authorization information like tokens, usernames or passwords. That means it is usually not a good idea to embed things such as database access credentials inside your game. Avoid providing information useful to an attacker whenever possible. Keep in mind that you have to wait for a request to finish before sending another one. Making multiple request at once requires you to have one node per request. A common strategy is to create and delete HTTPRequest nodes at runtime as necessary.